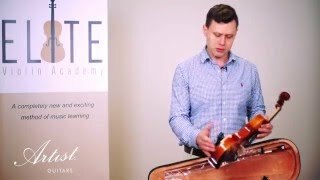 This complete set will provide you the ultimate pack to get you on your way to learning Violin! The first step is to have the player stretch out his or her arm fully ensuring that there is no bend in the arm. The second step is to measure the total distance from the neck to the centre of the palm. After following the above instructions, use the measurement and the sizing chart below to determine the proper violin size.